The Alpujarras is a 70km-long collection of valleys along the southern slopes of the Sierra Nevada. It is a mixture of dramatic mountains, deep ravines, sloping hillsides, huge gorges, and the most breath-taking views. It is full of many clusters of beautiful white villages, often seemingly clinging together on the side of a steep mountainside, which are a traditional feature of this area. 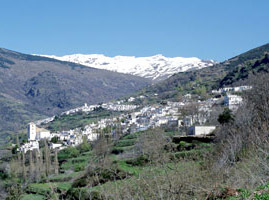 La Alpujarra, as it is popularly known, is famous throughout Spain because of its unique mini-ecology. The melting snow from above constantly waters its terraced farmlands, forming a high-altitude oasis of greenery, which stands in dramatic contrast to the arid foothills below. This area is a paradise for walking and trekking with innumerable footpaths snaking their way through the Sierra Nevada. The cultural interest of the region lies in its fifty-odd villages, which were the last stronghold of the Spanish Muslims, or Moors. The small villages are built in traditional Alpujarra style (flat roofs with tall chimneys) and flowerpots decorate every balcony. The trapping of mass-tourism are thankfully absent, but it is easy to find attractive restaurants and bars where the gastronomic delights of the region as well as international dishes may be tested. La Alpujarra has long been a home of artist and writers, attracted to the area by its enchanting beauty, looking for an alternative life-style. The region has also become more famous due to the success of several books written by residents. This began with Gerald Brenan who settled here in the village of Yegen in the 1920's and wrote 'South from Granada'. More recently, Chris Stewart's books ('Driving over Lemons', 'A Parrot in the Pepper Tree' and 'The Almond Blossom Appreciation Society') describe his life in a small farming community near Orgiva. The traditional life-style that he describes in his books is very evident when you visit the region and you can even drive down the very road which gave the name to his novel, where Chris was told 'Drive over lemons' on his way to see what would become his future home. All of this is on your doorstep, whilst at the same time being able to reach the centre of Granada town or the beaches of the Costa Tropical in an hour or less. This is the first village that you will come to when approaching the Alpujarras from Granada. Lanjarón lies 7 kilometres to the east of the Tablate Bridge, 40 kilometres from Granada and 49 kilometres from the coast at Salobreña. The Tablate Bridge is the official western access point to the Alpujarras. This bridge is of historic interest and was once of great strategic importance. On the 10th January 1569, one of the first battles between Christians and Moors was fought here. Lanjarón itself has a population of 4,500 and an altitude of 725 metres. One of the busiest and most visited spas in Spain is at Lanjarón due to the curative powers of its waters which gush from seven natural springs. The Balneario (spa) is open between March and December and as a result, the town has more hotels and other accommodation than any other in the Alpujarras. Its spring waters are also sold in bottled form as mineral water throughout Spain, and this is the brand you are most likely to be served in restaurants in the Granada province. Carrying on along the road from Lanjarón you will reach Órgiva, which is the largest village and capital of the western Alpujarras. 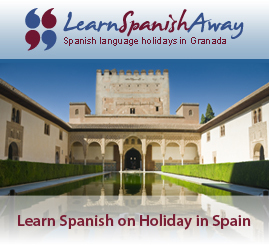 It lies 49 kilometres from Granada and 36 kilometres from the coast at Salobreña. It has an altitude of 450 metres and a population of 6,500. Lying on a four-way crossroads, Órgiva has a large commercial and trading centre and many bars, restaurants, clubs and hotels. Thursday is market day, when everyone from the surrounding villages turns up - either to buy or to sell. The parish church here is a 16th century mix of Baroque and Renaissance. There are also remains of a fortified Arab tower and at the Molinos de Benizalte, a 15th century Arab oil mill.